After more than a year of work spent on computer-aided designs for a hybrid conversion of the 2016 Chevrolet Camaro, the West Virginia University EcoCAR 3 team is finally able to share its plans for this innovative hybrid vehicle. Up to this point, the team’s hybrid architecture plans were not available to the public; however, with the arrival of the Chevrolet Camaro coming in December, teams may now share their elaborate plans. EcoCAR 3 is an advanced vehicle technology competition (AVTC) that challenges students from 16 university teams to redesign the 2016 Chevrolet Camaro into a hybrid-electric vehicle. These students are tasked with reducing energy consumption and greenhouse gas emissions, while maintaining the performance, safety, and consumer appeal of the original stock model vehicle. The competition is sponsored by General Motors and the Department of Energy, and is managed by Argonne National Labs. This is the second year of a four-year competition. When the Chevrolet Camaro arrives next month, the West Virginia University team will be ready to take those computer-aided designs and make them a reality. West Virginia University is building a P3 (parallel configuration with a post-transmission electric motor) plug-in hybrid-electric (PHEV) vehicle from a stock, eight-speed, six-cylinder 2016 Chevrolet Camaro. The batteries to power the hybrid systems are being donated from A123 systems. Electric power will be provided by a Parker GVM210-200S electric motor coupled with a Rinehart Motion Systems motor controller. The hybrid system will be controlled using an ETAS ES910 control module. The team will also be replacing the stock engine with a GM 2.4 liter I4 Ecotec LEA engine capable of Flexfuel operation. The vehicle will be completely rear-wheel drive with the engine and electric motor providing power to the wheels. 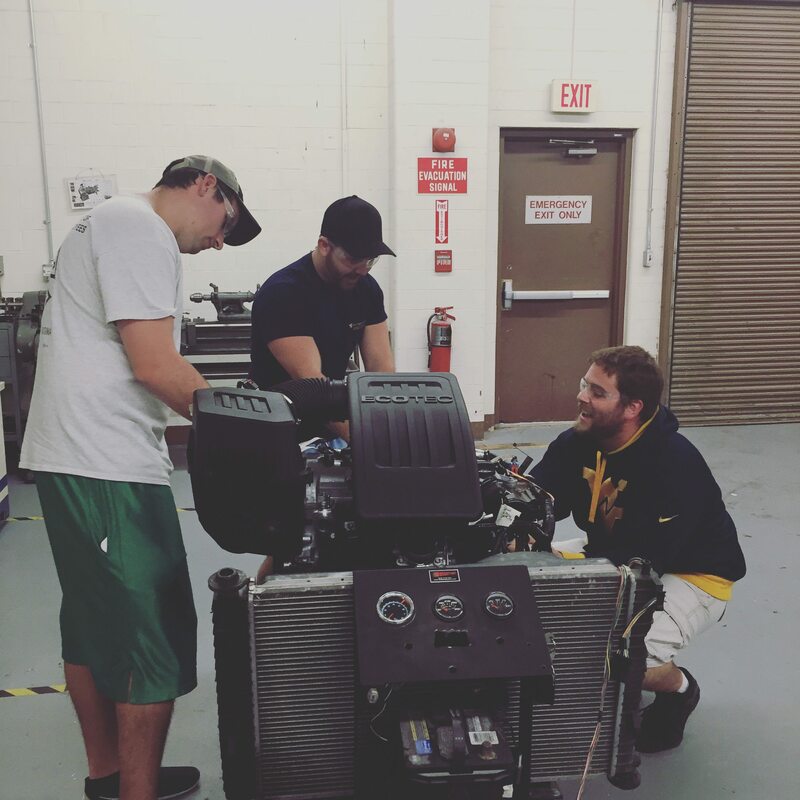 In addition, the WVU EcoCAR 3 team plans to use E85 fuel, which is a blend of 85 percent ethanol and 15 percent gasoline, to maximize engine performance and reduce tailpipe emissions. The students on the WVU EcoCAR 3 team are excited to begin implementing their designs very soon. With the help of the EcoCAR 3 competition-level sponsors, West Virginia University is creating something great. Who knows, one day, you may be driving the hybrid design developed by the Mountaineer team! For more information about the WVU EcoCAR 3 Team, please visit our website at http://ecocar3.org/wvu/about-us/#sthash.JIhMMGPb.dpuf, follow us on Twitter at @WVUEcoCAR3, or find us on Facebook at www.facebook.com/wvuecocar3 for continuing updates throughout the four-year program. EcoCAR 3 is a four-year collegiate engineering program that builds on the successful 26-year history of the Department of Energy’s Advanced Vehicle Technology Competitions (AVTC) by giving engineering students the chance to design and build advanced vehicles that demonstrate leading-edge, eco-friendly automotive technologies. General Motors provides each of the 16 competing teams with a Chevrolet Camaro, as well as vehicle components, seed money, technical mentoring and operational support. The U.S. Department of Energy and its research and development facility, Argonne National Laboratory, provide competition management, team evaluation and logistical support. Through this important public/private partnership, EcoCAR 3 provides invaluable experience and training to promising young minds entering the North American job market. EcoCAR 3 follows the widely acclaimed competition series EcoCAR 2: Plugging In to the Future.